The Bicycle Drive-In occurs this Saturday from 6 pm to 10 pm at Park(d) Plaza, located on 4th Street between Linden and Elm Avenues. The event is free. Oftentimes, we forget to intermingle things in favor of focusing on one thing in particular: music stays at concerts, bikes stay on roads, film stays inside a theatre, park space remains in the realm of play. Money plays a role. Planning plays a role. Everything plays a role. And though we are seeing events that provide a hodgepodge version of everything-cultural, these events usually lack focus and theme. Enter Bicycle Drive-In, part of the annual Summer and Music series of events throughout Long Beach, which has seemingly woven bicycling, film, music, and space into an event where one immediately links with the other. This brilliant little shindig began as a seed between Rand Foster–the always-cool owner of Fingerprints– and Micael Pradon–the songwriter-singer-bassist-producer-pop guru behind the Long Beach-based acoustic outlet Matteran Ghost. 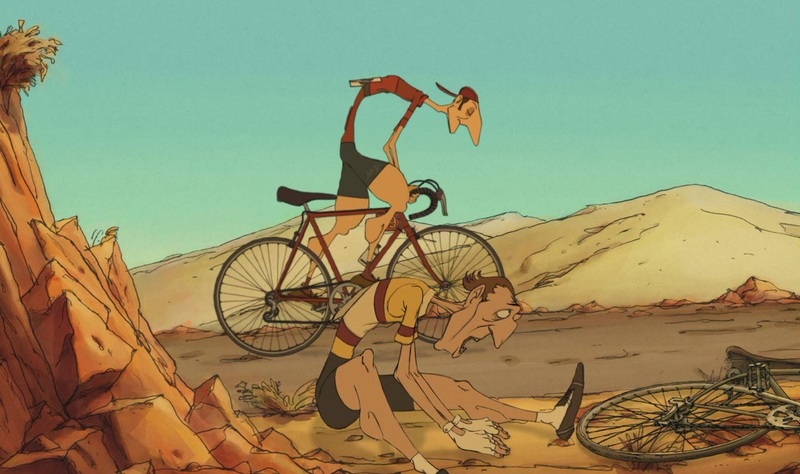 Pradon had been doing shows that, in true postmodern fashion, intertwined music and video, which ultimately led to a conversation about The Triplets of Belleville, the 2003 animated French film told almost entirely through song and pantomime. 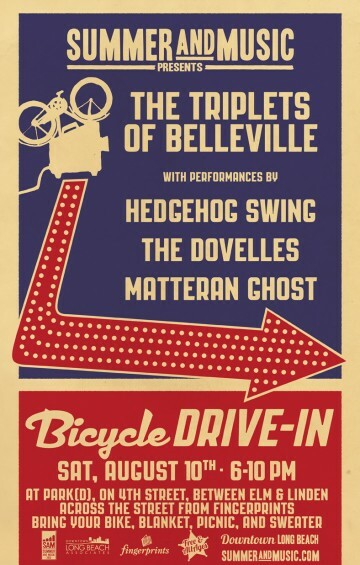 Bicyclists are encouraged to wheel themselves over to Park(d) Plaza, the parking lot appropriated by City Fabrick and turned into a public space, and listen to three bands–the aforementioned Matteran Ghost, the harmonic Dovelles, and Belleville-style band Hedgehog Swing–that all echo the gypsy swing-style music of the film. Following that will be the screening of the film itself. And during the entire event, bicyclists are encouraged to mow down on crepes and pedal around the East Village. The repurposing of a repurposed space is not the only diamond-in-the-rough of this perfectly themed event. It is a larger echo of Foster’s deep-held belief in the power of pedestrian and bicycle access.